We're going to buy a lucky user a game off of their choosing this holiday season! The only requirements are a 5 Color Combo account and the use of our game list feature! Beginning today and running until December 28, 2018 add any games you'd like to win into your 'Owned' and you could win! We'll speak with the winner and decide on the game together before purchasing. Here's the quick guide on how to use the feature. Under the game's main image in the 'Save' section, click on the 'Add to a List' link and select Owned. You need an account to do this so create one if you haven't already. We'll be randomly picking an account with games on their Owned List on December 28, 2018 and buy them a qualifying game to be sent to them! Good luck to everyone who participates! If you don't see a game that you want to add to your list. That's okay! You can add it to the database yourself! This is wiki style database and it only takes about 120 seconds to add a game with the basic details! 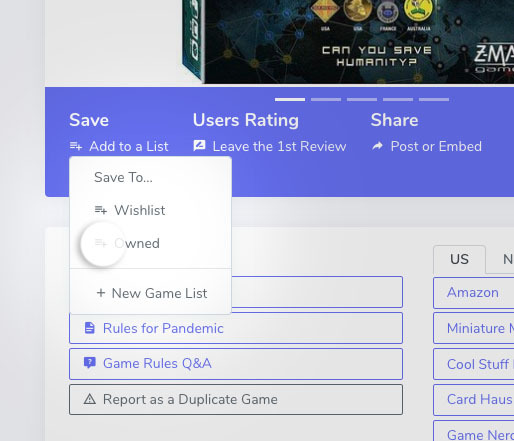 Go to the bottom of the website and click Add a Game under the Contribute section to add a game and get it on your Owned list!